During the early part of 2007 myself and Chloë, who at the time was 2E1IDT and now M0GEJ, decided that we should go away somewhere. The dates were set, as was the location. Jersey. We planned to fly over for a week and stay at the Youth Hostel at Haut de Garenne over to the East of the Island near to Gorey. Little did we realise at the time of booking that we would be on the island over the IOTA contest weekend, which turned out to be a rather fortunate oversight by the pair of us. 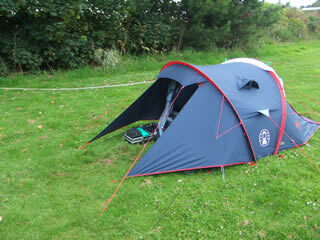 As we had decided to camp we were unable to gain access to mains power, though we did seek permission to erect antennas within the campsite grounds. Without mains power we decided that the only way that we could operate was to take my FT-817 and lots and lots of rechargable batteries so we could operate while other batteries were on charge in the Youth Hostel. Doublet with 88 foot top fed with approx. 9M of 300Ω ribbon, an ATX Walkabout with ATX mast (by Sandpiper) and a homebrew quarter-wave vertical for 40-6M (single band at a time). This is the tent that we inhabited and also operated from the week. We did do some operating from other parts of the island as well as plenty of exploring. A close up of the ‘shack’ that we used. 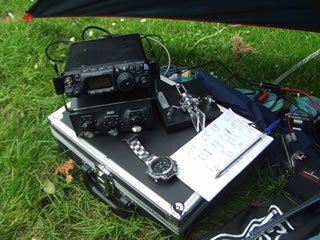 The trusty FT-817 and a Bencher paddle. 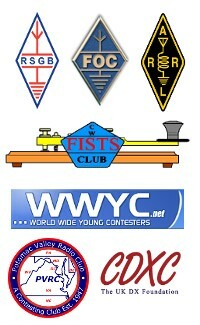 Playing QRP was fun, but much easier on CW. Look what the cat dragged in! Me in mid swing on CW trying to do two things at once (doesn’t often work!). 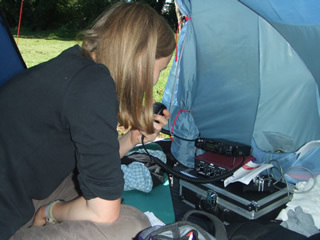 Chloë operating SSB with a whole 5W. I reckon the FT-817 would be better for SSB on HF with a speech processor. While on the island we made the trip over to the south west corner near Corbierre, which is the meeting place of the Jersey Amateur Radio Club. They’re based in an old WW2 German signalling tower, and have done an excellent job with the shack and antennas. 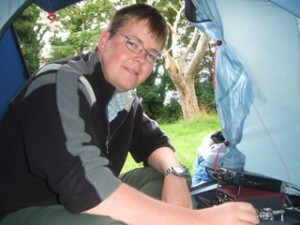 During our visits to the club there were preparations underway by Rich K2WR (also MJ0AWR) for his entry into IOTA as GJ2A. 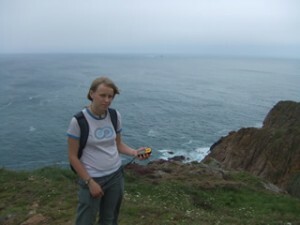 On the way over to the clubhouse for the first time we made an afternoon of it and had a wander around the cliffs near to the club, and even set up a portable station for an hour or so with the homebrew quarter-wave vertical on 20M CW. While I was operating Chloë was attempting to find a geo-cache that was supposed to be in the quarry. 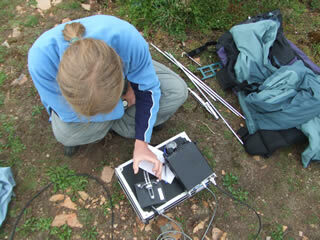 Me setting up the vertical on the edge of the cliff in a disused quarry near to Corbierre. This was the first time it had been erected and it worked very well, with a VSWR of 1.2:1 on 20M without an ATU. 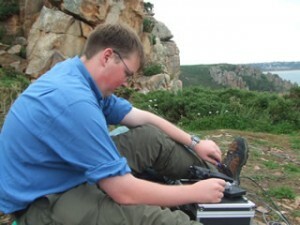 Me in the middle of a CW QSO, obviously concentrating very hard with the sending. It was a stunning view out to sea from the quarry. Chloë has a play with the Bencher in the quarry. This was over by the racecourse on the west coast searching for a geo-cache. We didn’t have much luck and only managed to find one out of the four or five we looked for. While in the vicinity of the racecourse we found the station that the Bristol Contest Group were setting up, also for the IOTA contest, as GJ6YB. They were housed in an old WW2 gun battlement on the top of a cliff. 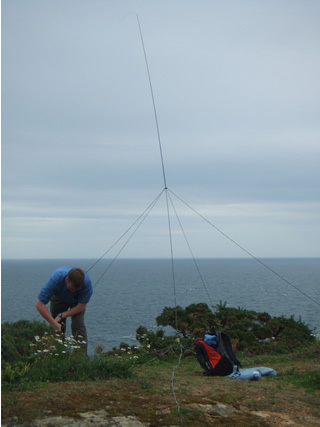 They had significantly better antennas than we had, though we didn’t manage to work them as they were just that bit too weak with us across the island. Not a bad result for a semi-serious part-time effort from a tent with battery power and a massive 5W to the 88′ doublet that was held in an inverted-vee formation by a tree next to the tent. Maybe in subsequent years we may travel to other islands, or ebven back to EU-013 to have another go in the IOGA contest. Most of all it was good fun. 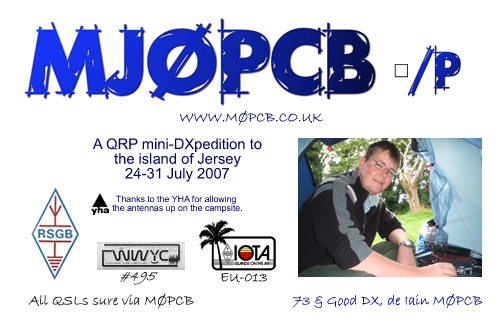 Once we got back, having made 99 QSOs in total as MJ0PCB (in the contest) and MJ0PCB/P at other times I set about designing a QSL card to send out. The card is shown below.